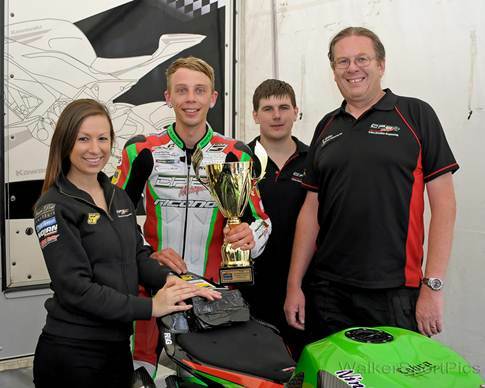 Two weeks on from a double podium at Snetterton and we were on our way up to Knockhill in Scotland. 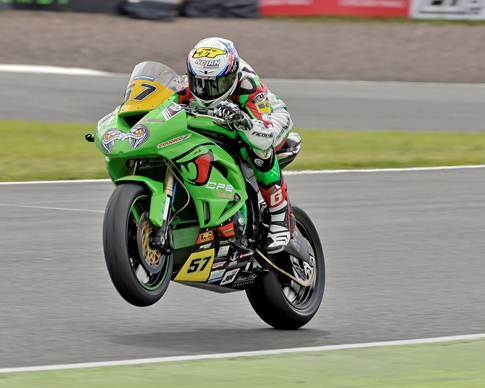 My confidence was high from a good result the previous round and I really get on well with the Knockhill Circuit. It’s very tight and technical and a lap time is only around 50 seconds, so it’s one of the shortest tracks on the calendar. Friday was a beautiful day and we got down to some great lap times in the opening two practice sessions. We were straight in to the 50’s on only 0.03 off the fastest Evo time set by Scottish rider, Matthew Paulo. The weather turned over night and we had severe storms Friday night and Saturday morning. It was so bad that it ripped up part of the track causing a hole to appear at turn one, where the bitumen had washed away. The rain was still coming down while they were doing the repairs on Saturday morning, but eventually they managed to resurface that part of the track and make it safe to use again. By mid-morning however, the fog had rolled in and you couldn’t see down into turn 1. This was a big safety concern so they had to hold off any track activities until the fog cleared. Eventually it did and to everyone’s surprise the track dried up quite quickly. Our qualifying session had been delayed until 3pm on Saturday, and the track was completely dry. We got down to some good lap times, and I qualified 4th for the 18 lap sprint race, to be held Saturday afternoon. I got a great start in the race and got away with Marshall Neill in 2nd. Paulo had managed to get a bit of a tow from the main supersport bikes and gained a slight gap to us. Joe Collier and Bjorn Estment then joined the battle with Marshall and I. Joe managed to get a slight advantage for 2nd, and it was then a battle for the last spot on the podium. On the final lap I was sitting in 5th, which I wasn’t prepared to take after sitting in a podium position most of the race. I passed Marshall in to the final turn and then managed to get a great run out of that turn to pass Bjorn over the start finish line, to take 3rd position! It was a hard fought podium and really happy with the race times. The lap time from Saturday qualified me 5th for Sunday’s 26 lap feature race. It rained for an hour before our race. But then it stopped about 10 minutes prior to us leaving for the grid. We went out on wets but the track appeared to be completely dry. On the grid the team had to work hard to get both wheels changed over to dry tires. They did well and gave me the bike I needed to fight hard for a good result. I got another great start and was right up behind Collier and Neill. We had gapped Paulo by 1.2 seconds, before a crashed meant the safety car had to be deployed. This bunches the riders up together for a few laps so the incident can be safely attended to. When we got going again we only had 10 laps left. Paulo managed to get passed me shortly after the safety car coming in. I pushed hard and held on to Neill and Paulo. I was sitting in fourth, in the battle for 2nd. I pushed hard to make up some ground in some corners, but then I would lose out in the next corner. I tried everything to get passed Paulo, but couldn’t quite manage it. Coming home in 4th position, 0.08 of a second behind Paulo. It was another successful weekend of good points for the championship, with a 3rd and 4th position. We have had some good consistent results, and are up the front like we want to be. I’m always working harder to improve as I know I can always do better. I’m really pleased to bring home another trophy for all the hard work my team and sponsors put in. Can’t thank them all enough and looking forward to Brands Hatch GP circuit in two weeks time!